I had a marvelous Jazz Night Out when my parents and I saw the first set of Jazz Arts Group Presents: John Ellis & Double-Wide at Notes on Friday the 21st. Saxophonist Ellis and his far-flung ensemble, including an appearance by Kendrick Scott on drums, delivered a joyous blend of New Orleans spirit (and funk) and modern jazz ingenuity. Their inventiveness was on display from the outset, as opener “Booker,” dedicated to New Orleans organist James Booker, was a bubbling workout that was highlighted by inverted lines from sousaphonist Matt Perrine and organist Gary Versace. As promised, Perrine was an essential element of the band’s sound, with a thrilling solo conjuring darting bumblebees on “High and Mighty” and a buoyant feature on the appropriately titled “International Tuba Day,” a tune that alternated between a Caribbean groove and circus bombast. As Ellis discussed onstage, his “Old Hotel” was indeed inadvertently reminiscent of “Hotel California,” but once Scott’s military drum patterns kicked into a lilting waltz with Ellis on soprano sax and Versace on accordion, the piece was its own invention, with an exciting section of Ellis and trombonist Alan Ferber trading and melding lines to dramatic effect. Set finale “Break Tune” was propelled by Perrine’s Nawlins swagger and found the ensemble leaving the bandstand in a funky fervor! This was an excellent ending to the first season of the Jazz Arts Group Presents series – excited for next year! Friday, April 28th (9pm – 12:30am): Honk, Wail & Moan’s Annual Sun Ra Celebration with Future Daughter at Big Room Bar (Brewery District). Sharing space with alternative radio station CD102.5, this South Side live music destination has expanded its jazz offerings of late, mostly due to being the new home of SwingColumbus’ Swingin’ Wednesdays, which bring regular appearances by live bands along with its DJ’d dances. But this weekend, a longstanding Columbus jazz powerhouse debuts there, as Honk, Wail & Moan resumes its annual tribute to “the music of late, great Mystic, bandleader & composer Sun Ra.” Sharing duties with the Columbus supergroup is upstart outfit Favorite Daughter, consisting of Eli Chambers (bass), Seth Daily (drums), Andrew Sais (guitar) and Caleb Miller (keyboards). As Miller told me, “The band originally got together to play an inaugural show with Radarhill this past fall and since gathered some original/Sun Ra material together,” so this should be a well-suited double bill! Cover is $5. Saturday, April 29th (10pm – midnight): The Isle of Klezbos: Benefit for the Kate Schulte Foundation at Natalie’s. 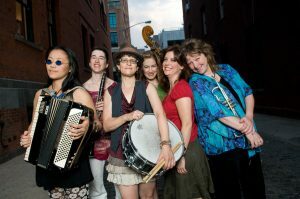 In continuing its mission to “promote equality through the arts, and to recognize the importance of diversity in our artists,” the Kate Schulte Foundation presents this NYC-based all-female ensemble that has played Klezmer, the music of the Jewish community, since 1998. Usually a sextet, band members hail from the Julliard and Eastman Schools of Music and have performed with acts ranging from Jay-Z to Cab Calloway to Bruce Springsteen. This event is a fundraiser for the Kate Schulte Foundation, and will feature “Give What You Feel” admission, with a recommended donation of $20. The minimum donation if tickets are purchased online is $10, and tickets can be purchased here. This should be an invigorating night of live music – welcome the band on their first trip to Ohio! Sunday, April 30th (6 – 8pm): Bobby Floyd Showcase: Mary McClendon with the Bobby Floyd Trio at Notes. In a new development, this week’s Showcase is the official Columbus celebration of International Jazz Day. 2017 marks the sixth annual installment of International Jazz Day, which includes a multitude of events worldwide and culminates in an All-Star Global Concert with Herbie Hancock and many more in Havana, Cuba that will be live-streamed around the world. Here in town, Floyd, bassist Derek DiCenzo, and drummer Reggie Jackson finish an exciting April with a showcase featuring McClendon, one of Columbus’ most revered vocalists, followed by the weekly jam session. Get tickets here to join in the international festivities!